We piled on the boat armed with our snorkelers and snacks. Our guide said she bought packedlunch for we are going to eat lunch at a secluded beach. Cool! Our first stop was the Twin lagoons. It was an hour's ride away from Majika but only about 15 minutes away from the port of Coron. There are two lagoons. The first bay was accessible by boat thus we anchored there. The second lagoon was accessible by either climbing up some rickety ladder glued to the wall of a limestone cliff then down to the second lake. We prefer the second option of swimming a few feet under the limestone cliff out to the second lake. 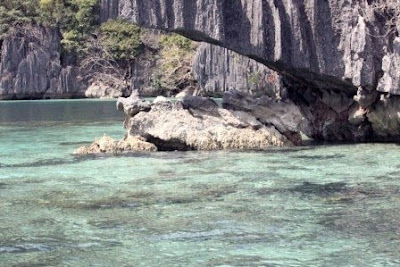 Ethan had to stay put in the boat as there was no way for him to climb the cliff steps or swim under the limestone arch. He stayed with my SIL on the boat.Fun! The water was clear, deep and blue! 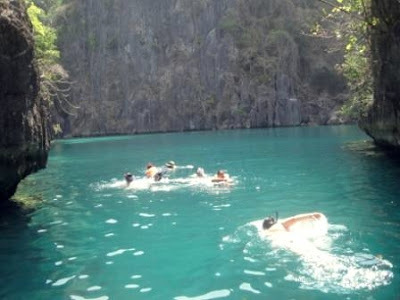 We were all happily splashing and snorkeling in the second lake when a piercing scream caught our attention. One of the tourists was stung by a jellyfish! 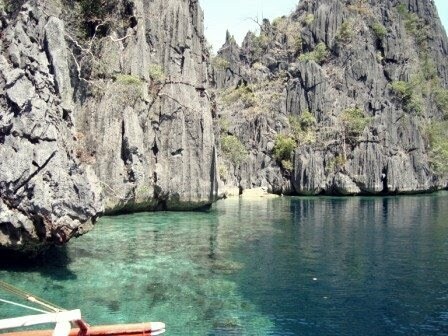 "Manong bangkero" was himself shocked as there was not supposed to be any jelly fish in the area. "A shark!" one of my tribe shouted. There was a mad scramble to reach the makeshift bamboo dock at the bottom of the limestone cliff. And there I was... laughing so hard at the comical scene before me. The "jellyfish" turned out to be a small territorial fish that has the tendency to bite whoever poses as danger. Oh one such fish bit me in Puerto Princesa. Painful but tolerable and not enough pain to mar my day. The lady tourist was beyond herself with "pain". Puhlease! I saw D1 and D2 and my other gloriously overly plump niece hit the water from the bamboo raft. These girls seriously need to do something about their weight. Diet pills? Well, maybe I should read up on the side effects of xyphedrine before I consider telling the girls about it. Anyway... jump right in. The water is fantastic. Wow, the water looks so invitingly cool. How beautiful that place is. Hope we can go there sometime. such scenery i just want to jump in there?where is this place anyway?